SoleMates is a walking program that combines the expertise of Camden Clark Medical Center with the efforts of the Grand Central Mall. The main purpose of SoleMates is to encourage the people of our community to choose a healthy lifestyle that includes exercise, such as walking. Representatives from the sponsors have worked to find the right combination of activities to meet the needs of the community. The hope is to give participants a greater incentive to walk.When are SoleMates meetings? All SoleMates meetings are held at the Grand Central Mall on the first Tuesday of each month at 9:00 am. Periodically health care professionals will give brief talks on topics of interest. Blood pressure checks will be available at all meetings. There is no registration fee to become a member of SoleMates. All offerings, such as blood pressure checks, are also free to members. SoleMates registration is held at each monthly meeting. New members can have their pictures taken for a laminated photo ID card. This ID card can be used to receive discounts at a variety of mall stores. At each monthly meeting, SoleMates members can have their ID cards “punched.” After attending three meetings, members will receive a free SoleMates T-shirt. Walkers will be eligible for additional incentive prizes in the future. Do I have to walk at a certain time? No. The Grand Central Mall is open to walkers between 8:00 a.m. and 10:00 a.m. (Monday through Saturday) and between 10:00 a.m. and noon on Sunday before the shoppers arrive. Several hundred walkers utilize the facility in the morning hours, but SoleMates members are free to walk at whatever time is convenient for them. The mall does offer security, a level walking surface, a regulated temperature controlled environment and aesthetic surroundings. How does the SoleMates incentive program work? SoleMates members are able to log the miles walked at the mall and work toward different incentives. Each time a SoleMates member walks at the mall, he/she records the appropriate information (date, his/her name, and the number of miles walked) on walking logs at the mall’s Guest Services desk. Incentive prizes can be “earned” at the following levels: 100 miles, 250 miles, 500 miles, 1000 miles and 1500 miles. Incentive prizes are awarded at the monthly SoleMates meetings. 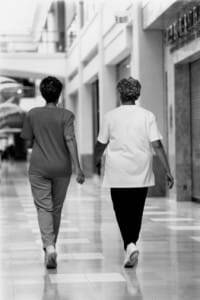 We realize that many of our members also choose to walk at other locations besides the mall. There are numerous walking tracks in the community that are excellent for walking, and we certainly don’t want to discourage our SoleMates from walking at other locations. But, because the mall is a joint sponsor of the walking club and provides some of the incentive items for our members, miles walked ONLY at the mall can be recorded on the walking logs. What is the distance around the mall? The distance around one time, including the food court area, is ½ mile. Many of our members enjoy walking outside during the warmer weather. The distance around the mall’s “ring road,” which is the road circling the mall for vehicular traffic, is 1¼ miles long. Whom do I call if I have additional questions? For additional questions, feel free to call Camden Clark Medical Center at 304-424-2055. Should I visit my doctor before joining SoleMates? Although walking is a great exercise for all of us, we do recommend that you get your doctor’s approval before beginning a walking program, and that you follow recommended guidelines. For more information on the SoleMates Walking Club, call (304) 424-2055 or e-mail joyce.hubner@wvumedicine.org.